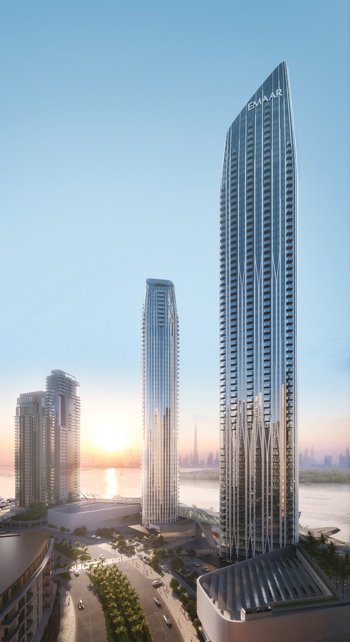 Address Harbour Point ... recently unveiled by Emaar Hospitality. Vida Harbour Point is the second hotel project in Dubai Creek Harbour by Emaar Hospitality Group, which recently unveiled Address Harbour Point, a premium lifestyle hotel and serviced residences to be operated by Address Hotels + Resorts. The new project, located in The Island District of the Dubai Creek Harbour mega-project, will offer spectacular views of the Dubai Creek, the Downtown Dubai skyline and the Ras Al Khor Wildlife Sanctuary. Vida Harbour Point will have 275 thoughtfully designed rooms for the new generation of business executives, entrepreneurs and leisure travellers. With its classic design, contemporary finishes and chic colour schemes, Vida Harbour Point integrates seamlessly with the creekside environment. In addition to a range of in-hotel amenities such as an all-day dining restaurant, health and fitness facilities, meeting rooms and events venues, guests will have direct access to a vibrant 4.5-km-long Creek Boardwalk and a marina that can berth yachts of varying sizes. The Boardwalk will feature retail, leisure, food and beverage (F&B) outlets, event spaces, galleries and water features. The interiors of Vida Harbour Point will embrace a fashion-forward concept underpinned by minimalist hues and open spaces exuding natural light. The neutral colour palette followed across the property assures a soothing ambience. State-of-the-art technology features will be deployed assuring fast connectivity. Several themed restaurants will be opened, with details to be announced in due course. A smart city of the future, Dubai Creek Harbour will feature several world-class hotels, retail precincts and residences, with Dubai Creek Tower, billed to be the world’s highest observation tower, serving as its anchor.